It was ludicrous for Obama to leave China out of things. China is the second biggest economy in the world, third if you treat the EU as a block. Had China been in the deal all along, we may not have seen the ludicrous provision that allowed companies to sue governments. That provision was one of the key reasons the deal failed. On November 10, in the wake of Trump’s election, Beijing sought to fill the void left by TPP by reviving its proposed Free Trade Area of the Asia-Pacific pact. The Financial Times reported Beijing Plans Rival Asia-Pacific Trade Deal After Trump Victory. Xi Jinping is rekindling efforts to promote a rival to the US-led Trans-Pacific Partnership trade agreement in the wake of Donald Trump’s election victory, Chinese officials said on Thursday. With Mr Xi set to travel to Peru this month for the annual Asia-Pacific Economic Co-operation summit, Li Baodong, vice-foreign minister, said China’s plan could fill the void. Chinese officials have previously sought to promote the proposal at Apec, only to encounter resistance from US officials who wanted to prioritise TPP negotiations. US officials have warned for months that the failure of the TPP would open the door to China to promote its own trade agreements. China’s efforts have been focused on wrapping up talks over a deal known as the “Regional Comprehensive Economic Partnership” with the 10 members of Asean and other countries including Australia and India. Death of TPP is at hand. 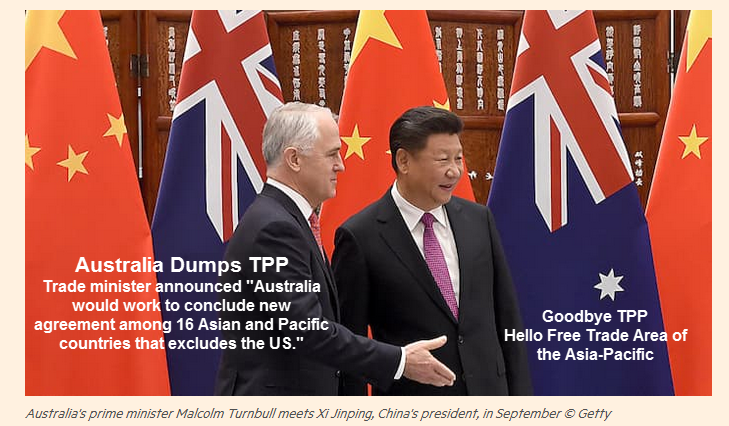 Australia leads the way: Australia Snubs US by Backing China Push for Asian Trade Deal. Australia is throwing its weight behind China’s efforts to pursue new trade deals in the Asia-Pacific region amid a growing acknowledgement the US-led Trans-Pacific Partnership agreement is dead in the wake of Donald Trump’s election victory. Steven Ciobo, Australia’s trade minister, told the Financial Times that Canberra [Australia’s Capital] would work to conclude new agreement among 16 Asian and Pacific countries that excludes the US. He said Australia would also support a separate proposal, the Free Trade Area of the Asia-Pacific, which Beijing hopes to advance at this week’s Asia Pacific Economic Co-operation summit in Peru. Australia’s decision to back China’s vision comes amid soul-searching in Australia about the impact a Trump presidency will have on its long-established military and strategic alliance with Washington. On Wednesday the opposition Labor party said Mr Trump’s election marked a “change point” requiring a careful consideration of Australia’s foreign policy and global interests. It is calling for more engagement with Australia’s Asian partners, although the party says the US-Australian alliance is bigger than any one person and will endure a Trump presidency. Mr Ciobo said he would not comment on whether US failure to ratify the TPP would undermine Washington’s influence in the region. He said he had sought a bilateral meeting with the US trade representatives at the Apec meeting in Peru to advocate ratification of the TPP. 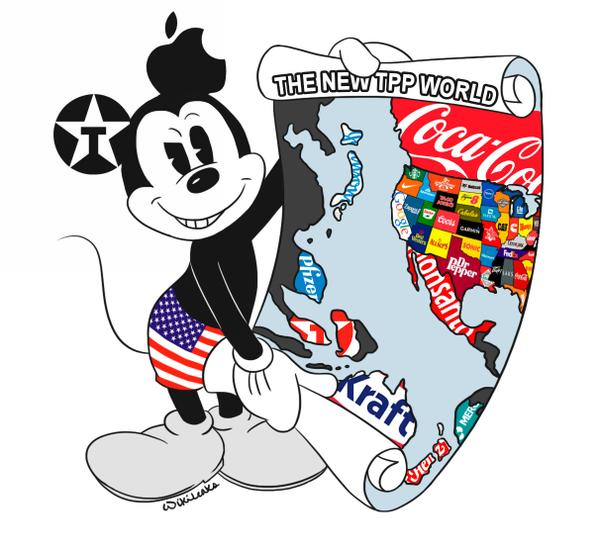 TPP discussions started in 2005. The US joined the agreement in 2008. Agreement was finally reached in 2015. Obama wanted to exclude China from TPP. As with Obamacare, Obama succeeded, but the patient died. Obama excluded China, negotiated in secret, insisted on global warming nonsense and did nothing about the US sugar lobby, but did allow corporations to sue governments. A trade deal 11 years in the making is now dead. Don’t blame Trump. TPP died on its own merits. November 15, 2016: Expect Global Trade Collapse; Bills That Won’t Be Paid; Deflation Coming Up? As I stated previously, this is a very ominous if not outright scary setup. Looking for a good trade deal? I happen to have one handy: Obama’s Trans-Pacific Partnership Fiasco vs. Mish’s Proposed Free Trade Alternative.